I LOVED your book “Automatic Millionaire” when I read it after borrowing it from a friend less than a month ago. “This looks intersting” I said. “I don’t know – I haven’t read it”, she replied. I asked if I could take it on an upcoming train ride I had (which I was taking to save money when my frequent flyer miles weren’t available). That night on the train I could not put down that book. That was 3 weeks ago. I have also purchased (Used, from a great used book website, I might add) your “Start Late, Finish Rich” and “Smart Couples Finish Rich” books and more copies of The Automatic Millionaire. As you might have guessed, my husband and I are a lot like Jim and Sue McIntyre that you wrote about. We are really sensible and we watch our “latte factors” – so why am I reading your books? Because I am now your biggest fan and I am giving them as wedding gifts (one to my nephew last weekend, and one to an employee who’s getting married in 2 weeks), and to friends who constantly complain about their debt. We just cannot relate to their spending. Well, I can but not my husband. He did all the things in your book from the age of 21 and now at 53 – he’s a millionaire. I was smart enough to dig myself out of $20k in debt in my late 20’s, then at age 34 when I was really learning how to save and still live well, I was smart enough to marry a man who was adamant and kept me on track financially. We are not new car people and for years friends have been saying we could buy a much bigger, fanicier house (which honestly for a while I really wanted to do) But this one is paid for and it is 1.5 miles from work and that is great because of the price of gas – or I can even WALK. Has saving a million been easy? No, but today I want to say that for the past 3 years I have maxed out BOTH my 401k and 457 plans at work because of the great tax breaks it gives me and because I want to “train myself” to live on about 50% of my income so that when I retire and my retirement plan “only” pays me 75% of my highest average salary – I will actually be “getting a raise” to retire! Make sense? It doesn’t to some of our friends. We have some who actually are trying to sell a house they love and want to keep because they are retired and going deeper in debt each month. It is heartbreaking. But when I read your book I thought this was interesing. They retired when they each could and knew what their incomes would become, with a guaranteed 3% increase annually. They still have a house cleaning lady ($75 week), they send out a lot of their laundry ($50 wk) they have a lawn service ($25 wk in spring-fall), they eat at lavish restaurants (Guessing at least $500 a month), they have high-end cell and cable services, that satelite radio service, vacation timeshare dues, and more – all that on top of a $2000 mo house payment and she’s 58 and he’s 62. 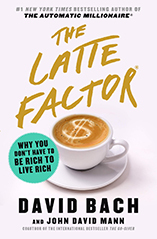 When I calculate their Double Latte factor I could easily cut $1200 a month – and coincidentally my friend told me if they just freed up $1000 a month they could stay in their house and travel more. I guess you can’t help some people see the truth: it isn’t what you earn, it is what you spend! Well I am now your biggest fan and biggest promoter. But sorry, I will be buying your books off Alibris.com– because I have yet to buy one used book there that did not look like brand new -and well, I can pocket the difference which has often been as much as $20 per book for hard backs (in the past not on yours of course! ).